Substitute Andy Williams grabbed a late winner as Swindon beat play-off rivals Preston to move up to third place in League One. The visitors had early chances, with Joe Garner and Paul Gallagher both going close. But Swindon's persistence paid off when Williams jumped to head in Ben Gladwin's centre for his ninth goal of the season. Preston remain second in the table, two points ahead of Town. Both sides went into Tuesday's rearranged game on the back of defeats - Swindon losing to MK Dons on Saturday while North End's nine-match unbeaten run in all competitions ended at Rochdale. But it was Town who were able to recover and close the gap on their rivals - although both clubs are still lagging behind unbeaten leaders Bristol City. Swindon keeper Wes Foderingham was busy early on, getting down low to block Garner's forceful shot before Leicester loanee Gallagher put the rebound over the bar. The hosts controlled first half possession but without any real threat on goal, their best chance coming from Louis Thompson, who made a weaving run through the defence only to place his shot at keeper Jamie Jones. The Swindon forwards began to press after the break and Australia international Massimo Luongo fed both Michael Smith and Harry Toffolo but neither could find the target, while Jordan Turnbull's looping header went just over the bar. Garner then placed a bullet header at Foderingham as Preston seemed to tire. And the introduction of Williams paid off once again for Swindon as he headed home in the 85th minute for his sixth goal from the bench this term. "I thought it was an outstanding performance. I thought we dominated possession from start to finish and the young players showed maturity. "It was an all-round incredible performance. I'm really pleased for the players because they got a little bit of stick on Saturday. They've showed tonight they can defend." Match ends, Swindon Town 1, Preston North End 0. Second Half ends, Swindon Town 1, Preston North End 0. Attempt missed. Alan Browne (Preston North End) right footed shot from outside the box misses to the right. Corner, Swindon Town. Conceded by John Welsh. Attempt missed. Andy Williams (Swindon Town) right footed shot from the centre of the box is close, but misses to the right. Substitution, Preston North End. Kevin Davies replaces Paul Gallagher. Goal! Swindon Town 1, Preston North End 0. Andy Williams (Swindon Town) right footed shot from the centre of the box to the top right corner. Assisted by Ben Gladwin with a cross. Corner, Preston North End. Conceded by Louis Thompson. Attempt saved. 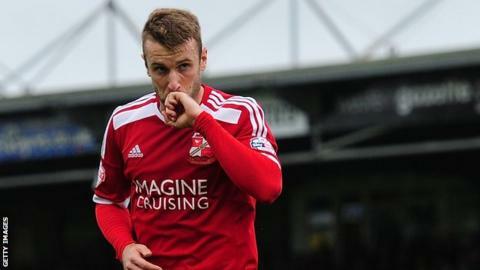 Nathan Thompson (Swindon Town) right footed shot from outside the box is saved in the centre of the goal. Corner, Preston North End. Conceded by Jordan Turnbull. Substitution, Swindon Town. Andy Williams replaces Jonathan Obika. Attempt missed. Yaser Kasim (Swindon Town) right footed shot from outside the box is too high from a direct free kick. Corner, Swindon Town. Conceded by Alan Browne. Corner, Preston North End. Conceded by Harry Toffolo. Attempt missed. Jonathan Obika (Swindon Town) right footed shot from outside the box is too high. Neil Kilkenny (Preston North End) is shown the yellow card. Harry Toffolo (Swindon Town) wins a free kick on the right wing. Attempt missed. Jordan Turnbull (Swindon Town) header from the centre of the box is just a bit too high.